I just found this fun site. 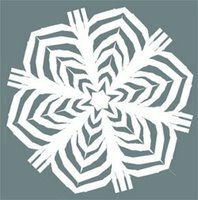 You can create your own cut-out snowflake, send it to your friends, catch other people's snowflakes, and comment on them. If you don't have anything else to do, you might want to check it out. Even if you do have other things to do, you still might want to check it out. After all, that's what the Internet is all about - wasting time! 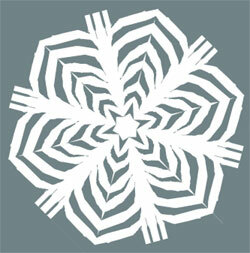 So visit Snowdays to catch my snowflake and make one or two of your own. The Teen Library Council had their end of the year party Friday night. A surprise visit by former volunteer group advisor, Caroline was one of the party highlights. There was plenty of food and fun. The teens were going to bake cookies but instead opted to just decorate and eat the ones that Maria had already baked. A couple of new members came to the party, giving them a chance to get acquainted. It was very enjoyable hanging out with these fun and energetic people! Yeah, but is that an A? Since Cory is in 8th grade, I thought I'd try this to see if I'd pass 8th grade math. I know I passed it the first time! And got A's, but I may have forgotten a few things in the meantime. Now I wish they'd just tell me which ones I missed and what the answers are! I hate not knowing. The kids didn't have school today. Of course they are always happy about that. It did snow off and on most of the day, but didn't really turn out as bad as they were predicting. The weather people around here always seem to expect the worst, but it rarely lives up to their expectations. Of course, the school district had to make a decision as to whether to have school or not early this morning before sending the buses out. I went out walking at 6:00 this morning as usual. The snow was not supposed to start until later this morning, but it had obviously been snowing for a while by the time I walked out the door. The flakes were huge, and falling fast and thick. It was actually pretty fun to walk in, but I was coated with snow by the time I got back. If it had continued to snow like that all day, this "snowstorm" really would have amounted to something! By the time I got back from my walk, the television station was running school closings across the bottom of the screen, and there was our school district. Cory was already up, but Beth hadn't dragged herself out of bed yet, so we told her she could stay in bed. You know she has to like that. She's a teenager. Cory said he was going back to bed, but that didn't last long. He was back up pretty soon working on the computer designing his house. They are designing houses in school right now in FACE, so Jeffrey let him install one of his home design software programs on the computer last night. Cory really seems to be enjoying it. Anyway, they picked a fine day to stay home from school. Jeffrey had some tests scheduled at the doctor this morning and took the rest of the day off. He had a day and a half of vacation time he needed to use by the end of the year. It was supposed to be our day, but we had to share it with kids! Oh well. Jeffrey was gone for a while this morning, and the rest of us stayed home. Once Jeffrey returned we watched a couple of the movies that Cory and I had checked out of the library yesterday. Good timing on that! We watched War of the Worlds and Stealth. They were both pretty good. Not great, but good. Now of course, the kids will probably have to make up the snow day later in the year. I don't remember doing that when I was in school. I do remember having many more snow days than the kids ever get. It just seemed that there was a certain number of snow days built into the school calendar, and sometimes we needed them all. One winter we missed a whole week of school because of snow. First it snowed and it blowed and all the roads drifted shut. The following day the sun came out, and we spent the day digging out, and the snowplows got the roads plowed. Then that night, the wind picked up and drifted everything over all over again. And so on and so on. That got to be a little much - of course, I was one of those kids who would rather have been in school. 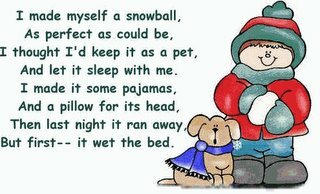 and this time I'll have to shovel! Our local library is sponsoring a special showing of the new movie The Chronicles of Narnia: The Lion, The Witch and the Wardrobe this Saturday morning. Tickets are $4, and the theater is offering a special deal on popcorn and soda. It sounds like it will be a very successful event - only a few tickets left. Cory and I will be going. Jeffrey and Beth didn't think they wanted to go, so we are leaving them home. I don't know if it's because they're really not interested in the movie or if it's just that hard to get up early on a Saturday morning. I'm really looking forward to the movie. I remember reading all the Chronicles of Narnia books when I was younger. I even bought the boxed set when Beth & Cory were young thinking I would read them all over again, and get the kids to read them too. However, I have this habit of rarely reading any books I own. Why? Because I can always read my books, but there are so many books from the library that I only have a short time to read. So I read the library books first, and don't get to my books. Then I check more books out of the library, and so on. I did, however, read The Lion, the Witch and the Wardrobe a couple of weeks ago - just to prepare for seeing the movie. I figure after the movie I will want to read the rest of the series. What were we expecting? After all, it is December. We spent yesterday at church and then stayed afterwards for food and fellowship. After all, that's what it's all about, isn't it? We were all warm and cozy in the basement and had no idea what was happening in the world outside. Imagine our surprise when we walked out to leave and found snow! It had obviously been snowing for a while and wasn't stopping any time soon. It didn't make the drive home much fun - but at least I wasn't driving! I could do it, and I would do it if I had to, but I didn't since I had Jeffrey! Isn't that what husbands are for? To drive when the weather is bad. We made it home safely and settled in for the night. This morning Jeffrey got up and shoveled the driveway. 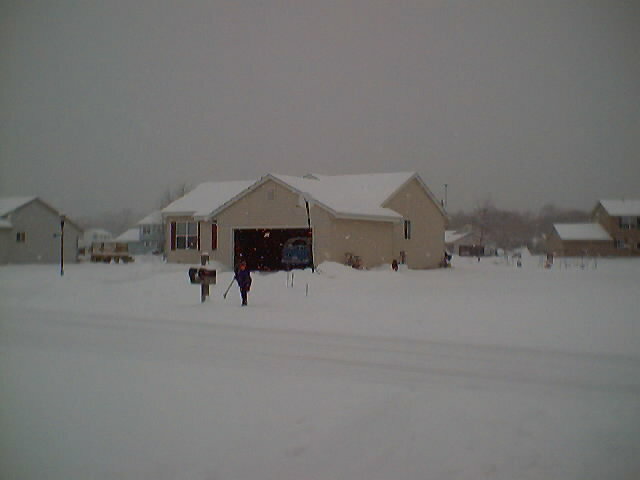 We had about 4 inches, making it the first significant snowfall of the season. (The picture is from last Saturday when we had less snow. I didn't even take any pictures today. I was lazy that way.) I would have helped him, but my shoulders and neck were tight, and I didn't think shoveling would help them any. Instead I sent Cory out to help. He didn't seem too thrilled but he did it anyway. After all, what good is there in having a teenage son if you can't put him to work? Also I told him that he should help his dad shovel since his dad was going to help him deliver his fundraiser items later in the day. That would only be fair. They went out earlier and delivered as much as they could, and now they are out again to hopefully deliver the rest. Cory did pretty well with this fundraiser. He sold $453 worth of stuff - chocolate, nuts, summer sausage, cheese, that kind of stuff. I had to write the check for the $453 when the fundraiser items came in this past week. So now Cory needs to get everything delivered so I can get my money back! 40% of the money is supposed to go into his account at school to help pay for band trips. That should help out a lot. They are supposed to go on a really nice trip next year. No word yet on where they will be going, but he's looking forward to it. OK, this really bugs me. I walk 2 miles every morning. That's not the part that bugs me. What bugs me is that every Wednesday (that's trash day here) I find all kinds of valuable stuff in the recycle bins. I rescue as much as I can, but I can't help wondering: How can these people just throw stuff away when someone could be benefitting from it? Collect labels from [ELIGIBLE CAMPBELL PRODUCTS] and participate in a [LABELS FOR AMERICA] program. Forward Campbell labels, proofs of purchase, or Labels for America™ confirmation to your school. Your school redeems labels for FREE [MERCHANDISE]. We're offering educators a way to earn money for those extras that aren't covered in your operating budget by redeeming caps from selected GG Golden Guernsey Dairy® and Morning Glory™ milk products. Through "Kids Caps & Cash," students are encouraged to collect caps from our half-gallon and gallon jugs of milk (poster, 185K PDF). The program has been extended for the 2004-2005 school year. If you are currently enrolled there is no need to enroll again. You may use the same identification numbers. We'll pay your school five cents for each specially-marked cap that meets our guidelines (69K PDF), up to a maximum of $10,000 for eligible & enrolled schools. Public, parochial and private schools serving students in grades K through 12 are eligible to enroll. Now you can help your school by simply enjoying the great taste of Kemps®. Buy your favorite Kemps milk products, collect the specially marked caps or proof-of-purchase symbols, bring 'em to school, and earn money for the things your school needs. Each stickered milk cap or proof-of-purchase symbol is worth 5¢, which your school can turn into computers, books, art supplies — you name it! So, please don't throw it away. It won't cost you a thing to help your local school.